Williamsons was set up for home sellers looking for an estate agent offering a fresh approach. Established in 2008, Williamsons is a proudly independent firm of Chartered Surveyors, Estate Agents and Valuers. We are a limited company and a member of the Royal Institution of Chartered Surveyors. Mark Williamson is an RICS registered valuer. The practice is owned and managed by Mark Williamsons FRICS, MNAEA, who has over 36 years residential sales experience of North Yorkshire. In the last 10 years, Williamsons have built up an excellent reputation in the sale and letting of both town and country properties in Easingwold and Boroughbridge and the surrounding villages, and the northern suburbs of York. Over the years, the Team at Williamsons have sold 100s of properties across North Yorkshire, including modern houses, new build, unusual cottages, period houses and development land. Maintaining a professional and personal service has been the key to our continued success. Endeavouring to ever improve the level of service, we have invested significantly in advanced computer technology, communication systems and office facilities, to display and match properties to our data base at the touch of a button. By harnessing and integrating these systems, we are able to help you sell or purchase property quickly and professionally. Our aim is to harmonise the best of traditional values with technology, to provide all our clients with a service second to none. With a team of dedicated and trained staff, our core business is buying, selling, letting and surveying residential property, with a passion and enthusiasm you will find refreshing. With 110 years combined experience and knowledge of the North Yorkshire property market, the team at Williamsons are energetic, enthusiastic, passionate and pro-active and have proven expertise in the sale of village, town and country houses. We tailor individual high profile marketing campaigns at targeted audiences. A personal service from approachable and friendly staff with regular updates and feedback ensures a smooth transaction from offer through to acceptance and completion. An initial Free Market Appraisal from Mark (our Chartered Surveyor) starts by providing you with a realistic guide on the market value. Underprice your home and you risk loosing thousands on the sale – overprice your home and you could be stuck on the market place unable to sell or attract viewings. We’ll even provide you with some hints and tips about making your property as presentable as possible. Just ask for our leaflet – it’s free. Our Comprehensive Marketing Package ensures your home gets noticed in the high street, in print and online. Professionally produced brochures create a lasting impression of your home and are designed to encourage buyers to pick up the phone and arrange a visit. We appreciate the importance of good quality photos to capture all the features of your home. Our PROFESSIONAL PHOTOGRAPHY images will showcase your home in print and on the internet. So it is important they show your property at its best. Floor plans give buyers a true prospective of the accommodation your home has to offer. At Williamsons we believe accurate floor plans are essential to the sale of every home. Make your home stand out on the internet. 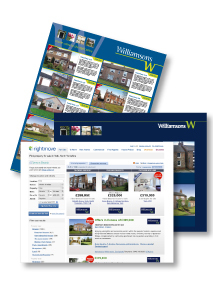 Your home will automatically appear on Williamsons-property.com as well as the leading property portals: Rightmove, Prime location, On the Market and Zoopla. We can even provide you with specially featured displays on these sites to really make your home stand out. We know that there is nothing more stressful than not knowing what’s going on. That’s why we’ll give you regular feedback following viewings, website hits, click through rates and proactively liaise with the solicitors, brokers and purchaser to ensure you’re kept up to date as your sale progresses from offer through to completion. It’s a genuinely personal service which we provide to every one of our customers. If you think all this comes at a price, be prepared to think again. Our class leading sales package comes at a very competitive price, so you won’t get to worry about estate agency fees taking an enormous bite out of your moving budget. Now that’s a refreshing change! or email mark@williamsons-property.com or by calling 01904 234545 or 01347 822800 or 01423 326889.